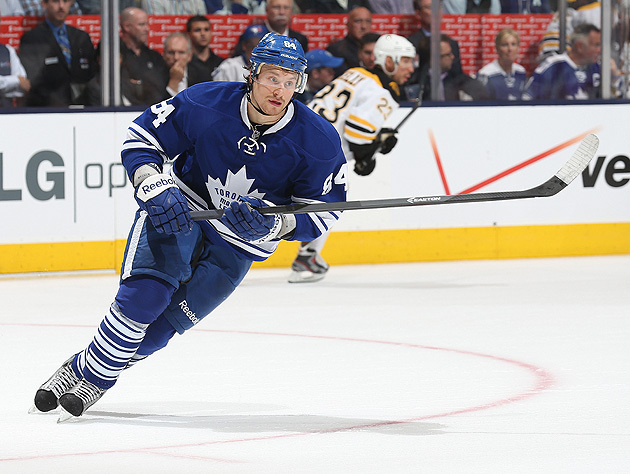 As impressive as the Toronto Maple Leafs were in their playoff series against the Boston Bruins, Mikhail Grabovski had a different experience. The forward had just two assists and was a minus-10 for the Leafs – a performance that came after a 9-goal, 7-assist one in 48 games this season. I spoke with Grabovski about the Leafs’ playoff run; whether Game 7 was his worst loss of his career; his season under coach Randy Carlyle; his Datsyukian goal attempt; his incident with Max Pacioretty; andwhat the future holds. Q. Let’s start with a couple of thoughts about the season. Yet it ended in a big disappointment. If you were asked to describe what happened in a few words, what would you say? Did you learn something new about the team during the playoffs? Experience to close out a game? Would you call the loss in Game 7 the worst in your career? You mentioned earlier that the Leafs are close to the level of being a contender, or how far? Coach Carlyle was using you inconsistently this season, sometimes as a shutdown center, sometimes not. Was it difficult for you to adjust to the changes and inconsistencies? How different were the coaching styles of Wilson and Carlyle? What were you told during the exit interview before the team went on the summer break? What was the best moment of the season for you? Could you talk about the trick you tried in the game against the Bruins, trying to bat the puck into the goal? I thought you took it out of Datsyuk’s playbook. What was it like playing in the KHL this season? What about the incident with Max Pacioretty? You like to set goals and make plans for an upcoming season. Have you done so for the next? Give us your predictions for the playoffs.